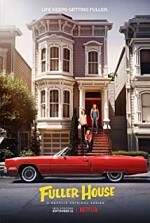 Watch Fuller House: Fuller House is a spin-off series based on the hit ABC family sitcom Full House (1987-95) created and executive produced by Jeff Franklin for Netflix. D.J. Tanner-Fuller (Candace Cameron-Bure) is a recently widowed mom to a 13-year-old named Jackson (Michael Campion), 7-year-old named Max (Elias Harger), and a newborn son named Tommy (Fox and Dashiell Messitt). After realizing she is unable to cope with the demands of holding a full time job as a veterinarian in addition to raising three kids, her sister Stephanie (Jodie Sweetin) and childhood best friend Kimmy (Andrea Barber), who is also the mother of a 13-year-old daughter (Soni Bringas), offer to move in to bring up her children.